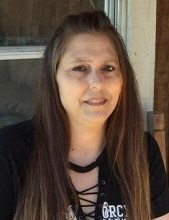 Funeral services for Julie Willis, age 42, of Centerville, will be held at 11 A.M., Wednesday, August 1, 2018 at the New Salem Cemetery Chapel in the Centerview Community of Leon County. Rev. Pearson Roberts will officiate the service. Interment will follow in the New Salem Cemetery, adjacent to the chapel. A brief visitation will take place before the service from 10 A.M. to 11 A.M. at the New Salem Chapel. Julie Jane Willis was born November 27, 1975 in Houston, Texas. Her parents were Elbert & Alpha (Tubb) O’Bannon. Julie had lived most of her life in the Leon County area and worked as a waitress in the food service business. She had been raised in the Baptist faith. Julie enjoyed fishing, dancing and spending time with her grandchildren. She also liked working with arts and crafts. Julie passed away July 27, 2018 in Tyler, Texas following a three year battle with cancer. She was preceded in death by both of her parents and brother, Gary O’Bannon. Surviving relatives include sons, Jackie Willis (Amber) of Onalaska and Travis Wills of Leon County; brothers, George Quinlan of Centerville and Steve O’Bannon of Livingston and sisters, Karen Roberts of the Robbins Community, Mary Ham of Streetman, Pam Carrisalez of Plantersville and Debbie Tuncap of New Caney. Julie is also survived by grandchildren, Natalie & Gemma Willis. To send flowers or a remembrance gift to the family of Julie Jane Willis, please visit our Tribute Store. "Email Address" would like to share the life celebration of Julie Jane Willis. Click on the "link" to go to share a favorite memory or leave a condolence message for the family.